Homes with solar sell for higher prices – increased sales dollars. Solar homes sold for 17% more than similar homes without solar. Solar homes sold 20% faster than the equivalent non-solar. 88% of homebuyers are looking for energy efficient features on their new homes. Higher pride of home ownership and lower cost of operation. Energy packages make the most sense aesthetically and financially when they are designed and built in the construction and mortgage of the home. Homes are more competitive compared to fossil fuels. Buyers are more interested in solar than the equivalent non-solar. Homeowners with solar typically have lower monthly energy costs which results in higher satisfaction. Efficiently manages utility and solar energy thus eliminating power interruptions. Provides up to a 10% tax free ROI, in perpetuity. Programmed to shed or add energy loads as necessary. Programmed to turn on appliances when energy costs are at their lowest. Provides the homeowner with energy utilization information to the circuit level. Upgrading to solar power could be worth it if you live in the right place –follows highlighted copy of script from video. Here’s a question: Is solar power worth it? That kind of depends on where you live. If you’re in an area that gets lots of sun and doesn’t have lots of extra fees associated with collecting solar energy, and you’re ready to make a long-term commitment to solar — sure! Solar power could be a good way to cut down on utility costs. But if you’re really wanting to make the switch, the upfront cost of installing panels and getting your home solar-ready can be expensive. The Solar Power Authority estimates the average cost of a 5kW system ranges from around $25,000-$35,000, but other trade groups say that cost is about half as much as of 2015. And those estimates don’t include federal credits. So, why does location make such a difference? One: Some places are just sunnier than others — and the more sun, the better. And two: Some states have incentives for solar-paneled homes, while others don’t. States like Nevada, Arizona and Hawaii — for example — might not be the best places to invest in solar, despite the sunny weather. In Nevada and Arizona, public utilities have enacted regulations that have driven up the cost for homeowners taking advantage of net-metering, which is when a home sells its excess solar power back to the utility companies. And Hawaii’s problem is that solar-paneled homes have sold so much surplus power back to the grid that utilities have become overwhelmed. And California has a history of being pretty pro-renewable energy, though even energy-savvy states have run into issues with power grids. “We’re using a structure that’s already in place. And I think there’s also some potential downsides to that, in that that structure — the grid itself — is coming close to 100 years old,” Griffin said. 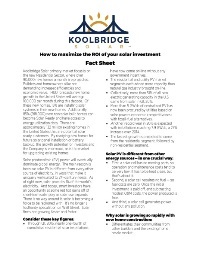 Koolbridge Solar is working on a system that helps homes retain 100 percent of the power gathered through panels on the house, which could eventually help homeowners get away from net metering altogether. But until then, it still makes sense to weigh all the variables when it comes to powering your home with solar energy — just in case. This video includes clips from Erik dHersigny / CC BY 3.0 and images from Getty Images, Jeremy J. Bristol / CC BY 3.0, Mani Amini / CC BY 3.0 and Creative Stall / CC BY 3.0.